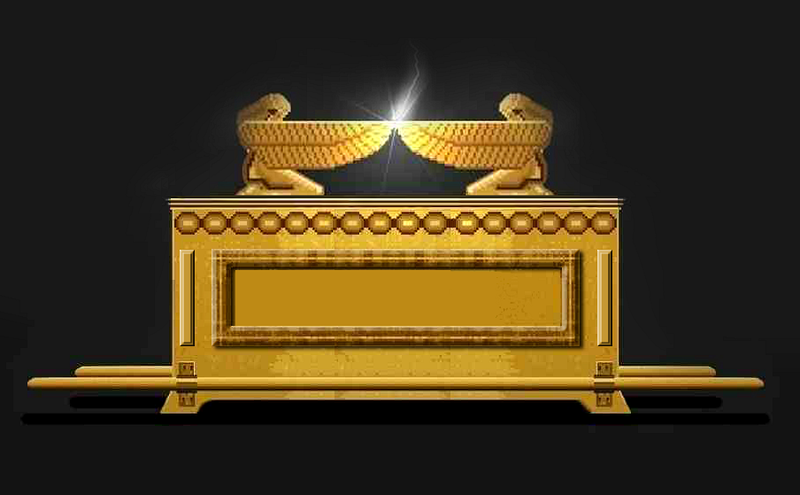 The ARK OF THE COVENANT was a visible sign of THE PROMISE OF GOD’S PRESENCE, a promise based on the agreement to follow hard after the Lord on a Journey of obedience! The Bible declares that all creation reveals the Glory of God! His attributes can be recognized by the sublime magnificence of His handiwork. When we make the deliberate choice to search for Him, we will find Him! His face becomes visible within the starry hosts of heaven and in the wind of the rustling leaves of majestic trees and in our hearts! However, God has also chosen to reveal himself in manifest ways throughout the history of Israel and in tangible form as the Son of Man. The manifest presence of God chose to come down, to a chosen nation set apart for his purposes, to initiate the awe-inspiring Plan of Redemption. A plan that would see the recovery of mankind from their lost state and restore them back to the everlasting arms of love, “I have come down to deliver them…” (Ex. 3:8). THE PRESENCE ‘CAME DOWN’ and lived amongst people—His very heart’s desire from before the foundation of the world! The Plan of Redemption, centered in Israel, held the Key to salvation for every tribe and nation on earth. THE PRESENCE came down and initiated the beginning of His transcendent Plan, a plan that is revealed on a Divine Journey, to be completed with His manifest PRESENCE ruling and a reigning over the earth from Jerusalem! God marked both the beginning and the end of this Journey, and significant milestones, with three major Feasts times and celebration. The Great Wedding Feast of the Lamb. The Feasts of Passover & Tabernacles reflect the beginning and the end of God’s Plan of Redemption. We have all entered on this Journey from Passover to Tabernacles with Him as we grow on our ascent to Union with the Christ as Jesus is the Alpha and the Omega! This is a Journey characterized by the Cross—we continually pass through a series of crosses in our life as we are purified and prepared for the Holy One—Jesus said we are to pick up our cross daily! THE JOURNEY IS ULTIMATELY HIS JOURNEY! God came down and carried Israel through the crossing over from Egypt into His purposes. He has been moving on this Journey through History purifying and gathering in His children along the way. At Salvation we enter into HIS JOURNEY and move out with Him to follow the Ark of THE PRESENCE! Those called to lead and carry the Ark of THE PRESENCE were required to be wholly consecrated unto Him and to carry the Ark in a prescribed way. David made the mistake of not complying with God’s demands resulting in a man’s death. David learned, as we must also learn, there is a protocol to be carriers of HIS PRESENCE, as He is a Holy God! IN THE PROCESS WE ACQUIRE THE UNDERSTANDING THAT WE ARE TOUCHING THE PRESENCE OF THE ALMIGHTY, THE LIVING GOD —THE GREAT I AM! In His great mercy God gives many chances to get it right, although there is sometimes a cost! David made a second attempt, this time doing it God’s prescribed way. They sacrificed every six steps and “David danced before the Lord with all his might” up to Jerusalem—Jesus’ Home and seat of His Throne (2 Sam. 6:14). The Body of Christ is on such a journey with THE PRESENCE. On our individual and corporate journey we have made many steps and pauses where were given the opportunity to praise, worship and thank Him that He would even allows us to be on the Journey with Him! About eight years ago I had a dream that I believe is significant to this time. In the dream I was wearing a very long coat. I reached deep into my pocket and pulled out a bottle of wine. On the bottle was marked boldly the number 414. The bottle was already open and a small amount had spilled. My friend then said that she was desperate to get this wine and went to make a call to see if she could find it. When she came back I asked her if she found it, she said she did but it was far too costly! Years later I was working on a particular chapter in my book, In His Image! the chapter title was For Such a Time As This based on the book of Esther. When I checked the scripture reference I saw that it was Esther 4:14. I then understood the meaning of the costly Wine. Esther could have lost her life but she counted the cost and made her decision, “If I perish, I perish.” The year I had the dream, Passover fell on April 14, revealing the very high cost that Jesus, our Passover paid on the Cross when His blood—the Costly Wine, was poured out for us! In 2014, Passover fell on 14/4/14, in a very special year marked by the beginning of a series of Blood Moons referred to as a Tetrad (see article—Shifting, Shaking & the Coming Blood Moons). The number 4 represented the YEAR OF THE DOOR. In the Hebrew alphabet the dalet is the 4th letter and means ‘door,’ and its numeric value is 4. The Body of Christ passed through a SPIRITUAL DOOR and SHIFTED into a season that God was marking with 4 Blood Moons! We are being shifted into the season of the COSTLY WINE. God is about to pour out an abundance of NEW WINE, that is very costly! There is always a cost to following the Ark of THE PRESENCE as David and Esther came to understand. As I was preparing to write this word in regard to the Blood moons in its relation to the movement of the Ark of His Presence, the Lord brought to mind the four Golden rings on the Ark. When building the Ark God instructed that FOUR GOLDEN RINGS were to be crafted on either side for poles. The poles were to be lifted up and carried on the priests shoulders. The Lord revealed that the 4 Blood Moons falling on the Jewish feasts of Passover & Tabernacles over a two year period, was a sign representing the 4 GOLDEN RINGS and 2 poles used to LIFT the Ark whenever it was time to move. This was marking a significant SHIFT in the Journey of THE PRESENCE from Passover to Tabernacles! On Israel’s journey, when the Cloud of God’s Presence moved, they were to move with it, and the Ark went before them carried by the priest. 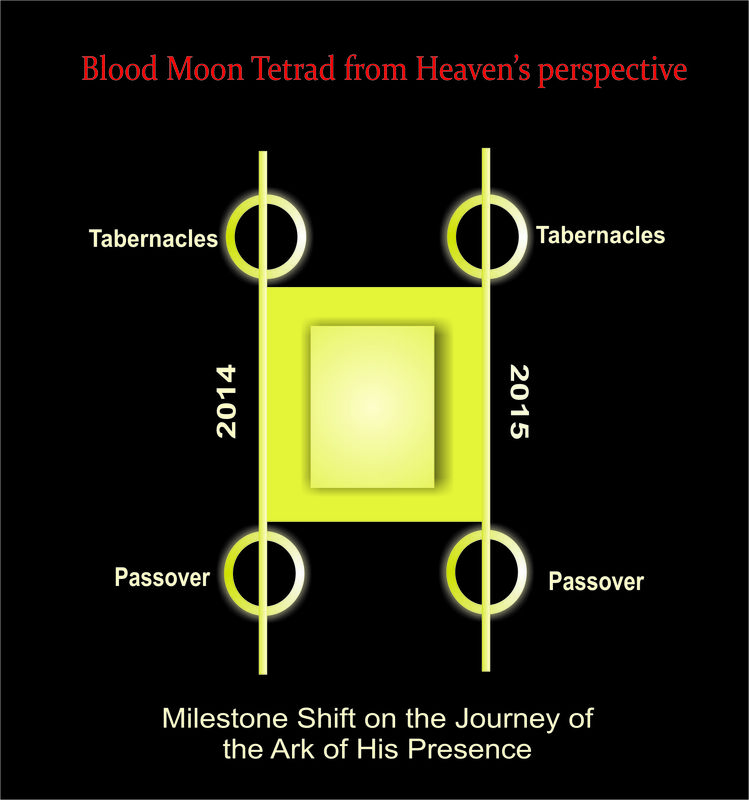 The Tetrad of Blood Moons, that began at the Passover Feast 2014, is a revelation that THE PRESENCE is moving and is making a MAJOR SHIFT on the JOURNEY up to Jerusalem, on its way to the Feast of Tabernacles to complete God’s transcendent Plan of Redemption! The Ark of THE PRESENCE moves progressively, taking territory on its way to establishing the Kingdom of God on Earth as it is in Heaven! God’s Presence is marking another major milestone of THE JOURNEY of His-story as He moves to fulfill His purposes on Earth! The procession of the King, up to the Seat of His Throne in Jerusalem is accelerating! 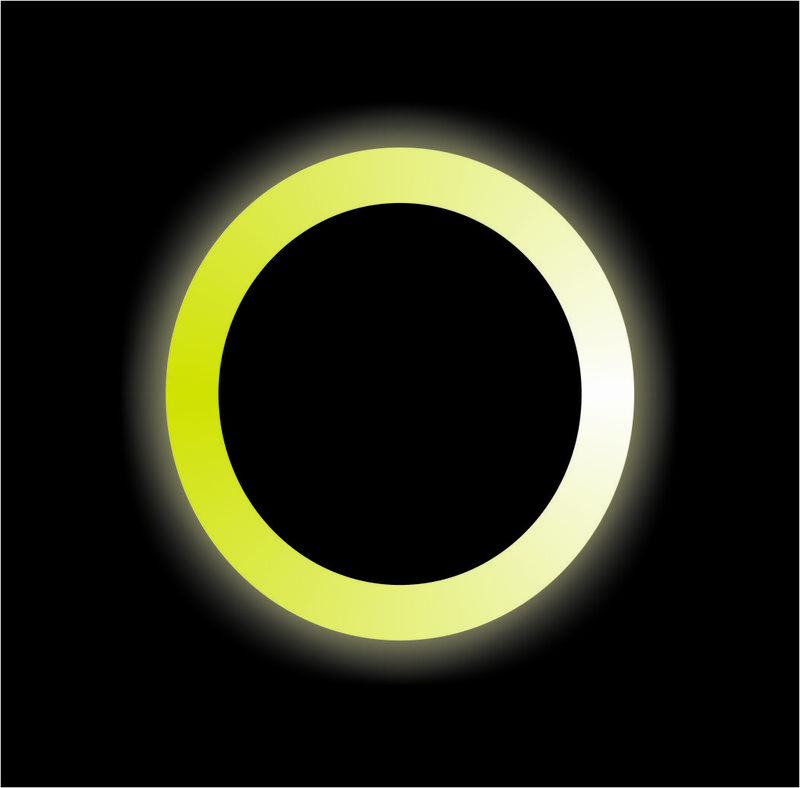 This is fiercely contested by the power of darkness. The Body of Christ must carefully watch the Ark of THE PRESENCE as we have not walked this way before (Josh. 3:4). We are entering an unprecedented season of the display of God’s power with signs and wonders, to undergird His work of completing His purposes. It is time to consecrate our hearts, set out from a secured position, be prepared to make sacrifices, and be ready to drink the COSTLY WINE He is about to pour out! We have experienced a measure of the Costly Wine of HIS PRESENCE, however, God has saved the best for last! He is about to pour out this LAST WINE in abundance to sustain His People! It is time to transition from the Jesus of Salvation, revealed in Passover, to the Jesus of Glory revealed in Tabernacles—from being Saved to being SEATED ON THE THRONE! As the final Blood Moon makes its appearance this month, God is sounding a trumpet to awaken and to mobilize His people. We are in the time of a major shift into the fulfillment of the promises of God to posses and occupy cities and nations for God! A time when strategies will be released to the faithful, the diligent and those prepared in wisdom. The Kingdom of Heaven is about to get very intentional about retaking the kingdoms of this earth for the Lord! The Lord of all the Earth is setting out and releasing the Armies of God to go forth with Him in Power and in the strength of His Might to complete His Will! Amen,Amen,Well said,All said,Nothing to add,except Amen! Praise God!! !